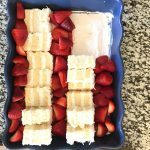 This Fourth of July cake is super tasty, super fast, super red, white and blue! Plus, it’s EASY! I needed a quick dessert, and this fit came to mind when I saw a Pepperidge Farm Cake on sale. Wash and slice strawberries. Wash blueberries. Put aside. 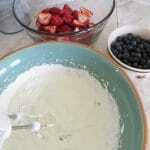 Whip the SOFTENED cream cheese, yogurt, whipped topping, and powdered sugar (if using) together. Make sure the cream cheese is completely soft or you’ll have lumps. 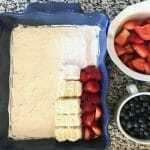 Spread the yummy combo into your 9″ x 13″ cake or casserole. Cut the cake in small pieces – remember you may need two if you plan to double layer the cake. Make a layer of strawberries halfway across the pan. 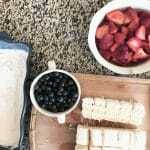 You are leaving an area for the blueberries which are added last. Follow with a layer of cake under it. Now make a second layer of strawberries and another layer of cake the full length across. I placed another layer of cake on top of each cake line. Now fill in with strawberries for the last line. Can you guess? YES! Fill in the hole with your blueberries! You can refrigerate the cake for a few hours, or freeze for no longer than an hour. 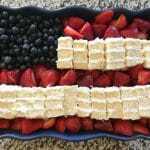 This cake is super easy and became the Best Fourth of July Cake ever on short notice. Have fun and enjoy!